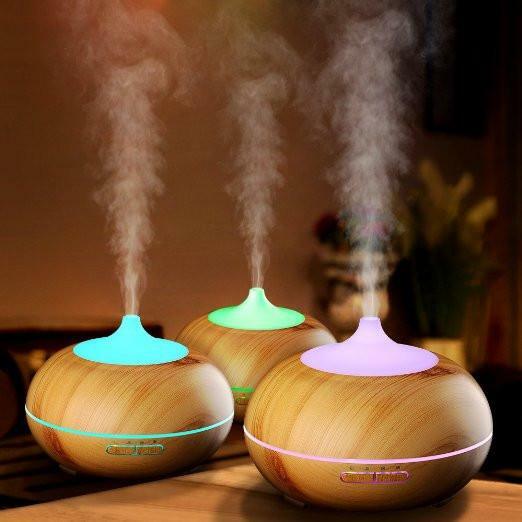 An Aromatherapy Diffuser enhances your mood and general psychological well being. A Humidifier helps make your living area more humid, healthy and comfortable, A machine can be both a diffuser and humidifier all in one. In aromatherapy, essential oils can be used therapeutically in a number of ways, including direct inhalation and topical application. Another common method is to use a diffuser, which carries the fragrance of the oil into the air and lets it linger in a space to impart its beneficial properties. The advantages of using this approach include having a more sustained effect and avoiding irritation that may come with the combination of certain oils and sensitive skin. 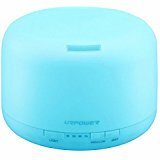 Ultrasonic/Nebulizing: Similar to a humidifier, these machines use electronic frequencies to produce a fine mist from essential oil added to water. Vibrations carry the tiny oil and water particles into the air. This type of diffusion uses no heat and has an added moisturizing effect. This approach is sometimes referred to as nebulizing. Some water-less nebulizers use oil alone. Heat: These products, which range from small plug-in models to larger machines, use warmth to disperse scents, often by gently heating a pad containing essential oil. Aromatherapy experts have noted that the kinds that utilize substantial heat should be avoided since the oil's composition may be altered by a significant temperature change, leading to decreased wellness benefits. Models known as “burners” are powered by a single tea-light candle; they are affordable but not as precise or safe as plug-in models. Reed: This simple and inexpensive method involves a few inches of essential oil mixed with light carrier oil in a glass jar or vase. When specialized reeds are placed in the container, the oil travels up the sticks to release its aroma. This approach works best when the reeds are flipped occasionally and the opening of the container is narrow or partially covered to prevent evaporation. Some of these products use "fragrance oil," which is not necessarily essential oil. Evaporative​: Blowing air from a fan is the mechanism behind this kind of diffusing. While this method is good for generally circulating a fragrance, the evaporation process initially releases only lighter particles, leaving the heavier particles until the end for somewhat uneven dispersion. While many essential oils are well suited for diffusers, some thicker, more viscous kinds such as sandalwood and ylang ylang may not work with all varieties or might diffuse at a slower rate. Lighter oils such as lavender, lemon and orange tend to diffuse at a faster rate due to their thinner viscosity. Essential oils may be mixed together from recipes and then diffused to effectively promote specific benefits for emotional balance, mental clarity, romantic desire and other aspects of overall wellness. It is important to remember that essential oils are typically highly concentrated; a few drops are often enough to confer benefit. Refer to manufacturers’ directions for exact number of essential oil drops to be used in different types of diffusers.